I have recently begun working on my next painting, Rugged Grand Tetons! After finishing the drawing layout, I completed the sky and am now working on the mountains. I have been excited to paint this image for quite awhile and am loving how it is coming together so far. I have a ways to go, but it is coming along faster than l expected. Keep an eye on Facebook and Instagram to see some additional work in progress photos. This will be the second painting in my National Park series. When completed, it will be available in four sizes. In deciding which four of the many scenic views found in Yosemite to capture for my Yosemite Park series, I determined the final painting would focus on the granite monolith El Capitan. Additionally, I was looking to place each of these four icons of the park into the four seasons. During one of my many visits to Yosemite, the snow came floating down and began covering the road as I drove down into the park one evening. The sight of Yosemite covered in a pristine white blanket of fresh snow is an amazing sight and one I just had to capture. After nearly four months of planning, designing, photographing and editing I am excited to announce that I have completed my first video. The idea of creating this movie began with a very good friend of mine repeatedly stating that we should make a video to capture the process of creating my paintings. After I finally agreed to the idea, Jonathon and I began talking about the concept which eventually morphed into an introductory video, showing the evolution from my early years to where I am now. I am so grateful and thankful for all of Jonathon’s time and efforts! Good friends are a true blessing in life. You can watch my video on my About page. I also now have a new Keith Rust Illustration YouTube page. I hope you enjoy! There never seems to be a bad view in Yosemite! With every scenic drive or winding path you take the views are constantly changing as the position of the trees and the reflections in the river offer new and breathtaking scenes to capture. Additionally, the momentary changes in lighting from the soft early morning light to the vivid setting sun brings the scenery to life. However, nothing really transforms the scenery as much as the dramatic and awe inspiring effect of the seasons. The seasons truly have a way of visually transforming this beautiful valley like nothing else, and it is this annual effect that I felt compelled to capture. While nearing the end of an 8.9 mile Panorama Trail hike in breathtaking Yosemite, a buddy and I had to take a much needed break at Vernal Falls. We had been walking for hours on a very warm day, and unfortunately, we did not pack enough water for our journey. About the time we reached Vernal Falls I was approached by a rescue worker who noticed I was very red in the face and quite dehydrated. She gave me some cool water to drink and started pouring water over my head to cool me off. I had no idea that I was that bad off. Afterwards, we walked over to the river to cool off our legs. We sat there for a good half hour enjoying the falls and relaxing. Sitting at the rivers edge I was inspired to try to capture this intimate peaceful beauty and strength displayed before me. I can never get enough of the awe-inspiring beauty that is Yosemite National Park. Everywhere you look in the park you will find unbelievable beauty on display. A couple summers ago, I hiked the 8.9 mile Panorama Trail from Glacier Point. Along the way I would stop to take photos to try to capture the amazing scenery all around. As I came up the switchback laden hill from Illilouette Falls, I saw the potential for one of my future paintings and began capturing shots that I could use to compose the scene I was envisioning. I especially loved how the water falling from Nevada Fall looked so refreshing and inviting as it tumbled into the bed of trees below with the mist billowing upward. Every time I visit this park I see something new and remain in awe of its grandeur. Growing up in California, Monterey is one of my favorite California locations. Living in northern California, we spent most of our family vacation time going to our cabin in the Lake Tahoe area. But during an encounter on a flight to Hawaii as a young child, I met an older couple from Monterey with whom I fell instantly in love. That chance meeting grew into a deep and lasting friendship. As I grew older, I would drive down with family or friends to spend time with them and enjoy the amazing beauty that I discovered during my visits to the area. This quickly became one of my go to destinations. When it came to the fall season, the painting obviously had to focus on the changing colors of the leaves and what better than the Quaking Aspens in front of Sneffels Range. Next to winter, fall is a very close second to being my favorite season. I love all the various warm colors pouring into the vegetation, the increasing gusts of cool winds as they rustle the leaves, and the memories of large family gatherings around a beautifully decorated table at Thanksgiving. My father, who grew up riding horses on their family ranch, suggested I add an image of a cowboy riding down in the meadow; unfortunately this series of work is mainly focused on nature and occasionally some wildlife. Coming up with the elements to design my summer illustration was easier once I wrote up my description. I use these descriptions on my website in addition to my Certificates of Authenticity, which are found on the back of my artwork. I wanted to communicate a story with visuals, and so I began by creating a frame of trees that would draw the viewer back into the painting. In the background I placed the Rockies with a morning sky spreading out over the vista. The lake below displayed a calm, still feeling with relatively undisturbed reflections. I felt that the addition of wildlife with the moose drinking by the water's edge would further add a sense of peace to this tranquil scene. Colorado seems to have no shortage of gorgeous dramatic backdrops, so for this design I chose to feature the iconic Maroon Bells, two peaks (Maroon Peak and North Maroon Peak) located in the Elk Mountains. To enhance the range, I decided to add a large thundercloud billowing up from behind. 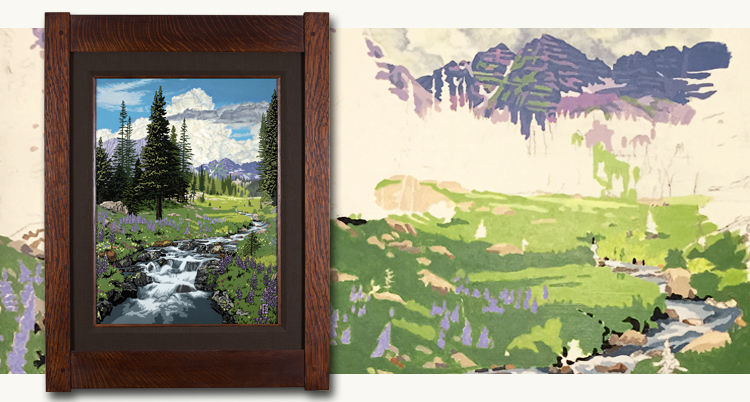 It became quite easy to visually depict the feel of springtime by adding all the wildflowers bursting up through the rolling grassy meadow, and I loved how the lupine brought out the colors in the mountains. I absolutely love the sound of waterfalls and streams and could sit for hours watching them. I was really looking forward to getting in and starting to paint this image, especially the water flowing over and around the lichen covered rocks.